I found a couple of fun Pinterest ideas for fall/Thanksgiving. 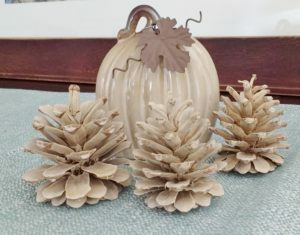 First off, this bleached pine cone idea caught my eye. I thought they’d be a great way to add a little seasonal decor to the beach house, ocean-style. Basically you plunk a bunch of pine cones into a half and half mix of water and bleach. 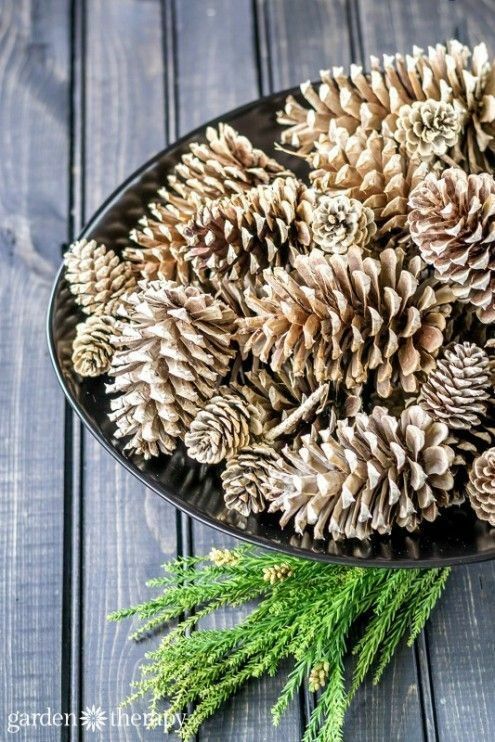 The pine cones will close up and some will look like they’re not even changing color at all. After 24 hours in the bleach solution, you take them out, rinse them off, and let them dry in the sun. They will take awhile to open up and look normal again, but once they’re dry, lo and behold, you’ve got these pale weathered-looking pine cones. Here’s a photo of my pine cones after they were bleached. Aren’t they pretty? The little ceramic pumpkin that they are sitting with came from the Family Dollar and cost just a dollar. 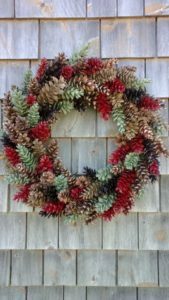 Another idea I’m thinking about trying — again with the pine cones– is a fall/winter wreath. 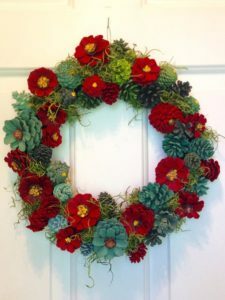 You paint the pine cones a variety of different shades in the same color family, then attach them to a wreath. I have a few grape vine wreaths that need a new look, so I will be experimenting. And finally, doesn’t this dessert look absolutely yummy? They’re Pumpkin Cheesecake Bars. Honestly, how could you go wrong? These are definitely on my list to try, maybe even today. We are having our big kids over for dinner this evening, and I am thinking they would happily be my recipe testers. I hope your fall is going well and that you are enjoying the season thoroughly! I’ve missed your post!!! 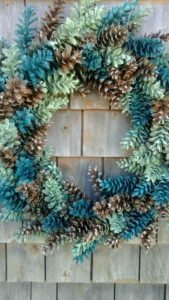 And I love that blue pinecone wreath. I love this time of the year! These are great ideas for decorating. I’m eager to see what you come up with for the wreath. Will it be for the Beach House or your normal house? I think I’d like to try one for our house. That recipe looks delicious! Did you try it yet?